This example shows how you can use PROC GAMPL to build a nonparametric logistic regression model for a data set that contains a binary response and then use that model to classify observations. The data set contains nine variables, including the binary response variable Diabetes. Table 42.15 describes the variables. Output 42.2.1 shows the summary statistics from the parametric logistic regression model. Output 42.2.2 shows fit statistics for both training and test subsets of the data, including the misclassification error for the test data. Because the response variable Result is binary, the DIST=BINARY option in the MODEL statement specifies a binary distribution for the response variable. By default, PROC GAMPL models the probability of the first ordered response category, which is a negative diabetes testing result in this case. The EVENT= option specifically requests that PROC GAMPL model the probability of positive diabetes testing results. The “Response Profile” table in Output 42.2.3 shows the frequencies of the response in both categories. You are modeling the probability that Result='1'. Output 42.2.4 lists the summary statistics from the nonparametric logistic regression model, which include spline transformations of all variables. The “Tests for Smoothing Components” table in Output 42.2.5 shows approximate tests results. Although some spline terms are significant, others are not. The null testing hypothesis is whether the total contribution from a variable is 0. So you can form a reduced model by removing those nonsignificant spline terms from the model. In this case, spline transformations for NPreg, Pressure, BMI, and Triceps are dropped from the model because their p-values are larger than the 0.1 nominal level. The following statements use PROC GAMPL to fit a reduced nonparametric logistic regression model. The OUTPUT statement requests predicted probabilities for both training and test data sets. The ID statement requests that the Diabetes and Test variables also be included in the output data set so that you can use them to identify test observations and compute misclassification errors. Output 42.2.6 shows the summary statistics from the reduced nonparametric logistic regression model. The values of the information criteria are better than of the parametric logistic regression model. In the “Estimates for Smoothing Components” table in Output 42.2.7, PROC GAMPL reports that the effective degrees of freedom value for spline transformations of Glucose is quite close to 1. This suggests strictly linear form for Glucose. For Pedigree, the degrees of freedom value demonstrates a moderate amount of nonlinearity. For Age, the degrees of freedom value is much larger than 1. The measure suggests a nonlinear pattern in the dependency of the response on Age. The “Tests for Smoothing Components” table in Output 42.2.8 shows that all spline transformations are significant in predicting diabetes testing results. 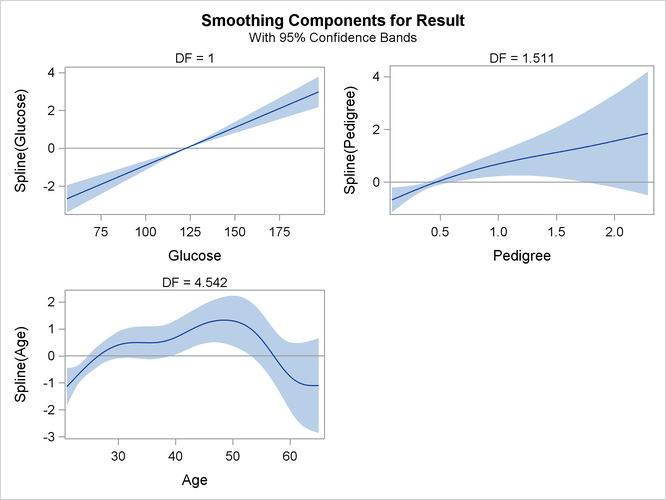 The smoothing component panel (which is produced by the PLOTS option and is shown in Output 42.2.9) visualizes the spline transformations for the four variables in addition to 95% Bayesian curvewise confidence bands. For Glucose, the spline transformation is almost a straight line. For Pedigree, the spline transformation shows a slightly nonlinear trend. For Age, the dependency is obviously nonlinear. Output 42.2.10 shows the misclassification errors for observations in the test set and observations of each response category. The error is smaller than the error from the parametric logistic regression model.